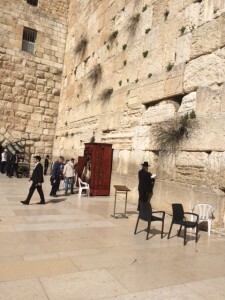 Western Wall of the temple Mount today. For the past 30+ years Connie and I have been taking prayer requests to the Wall for hundreds of Believers around the world. It is one of our greatest blessings and on that has given us the most joy. Today we took several hundred prayer requests and prayed over them once again before putting them in the cracks of the Wall. We know God answers prayers where ever you are, but there is just something so very special about this place, it has a spiritual meaning that can only be understood by those who have been there. What has always been so amazing is the amount of miracles we have witnessed for those we have carried requests to the Wall. They cover nearly all areas of life from health to finances, marriages and family healings. We can only thank God for those who have over the years for trusted us and given us the honor and privilege to serve them in this way.